In regular fluorescence a material absorbs UV radiation and emits lower wavelength visible light. At the atomic level an electron is pushed to a higher energy level (excited state) and on relaxation it emits a photon with a wavelength inversely related to the energy jump. These jumps are quantized and the emitted light comes with a specific color. For example glow sticks are green, yellow or blue. The color white is not an option because white light is simply a mixture of all colors. A recent report by a Korean / Spain based team (Park et al. 2009 DOI) of a single-molecule white-light-emitter should therefore raise some eyebrows. Yet, when you dissolve coolly named compound W1 (see graphic) in in chloroform and throw a UV lamp (254 nm incoming) at it, a beautiful color white (400-700 nm outgoing) beams back at you. So what is going on (pic here). W1 is a dyad (linked by an ether group) of blue color emitting HPI and complementary color yellow emitting HPNI. When HPI and HPMI are mixed the color white does not appear because of energy transfer between excited donor HPI and ground-state acceptor HPNI but in the dyad this transfer is prohibited (frustrated) due to geometric constraints. 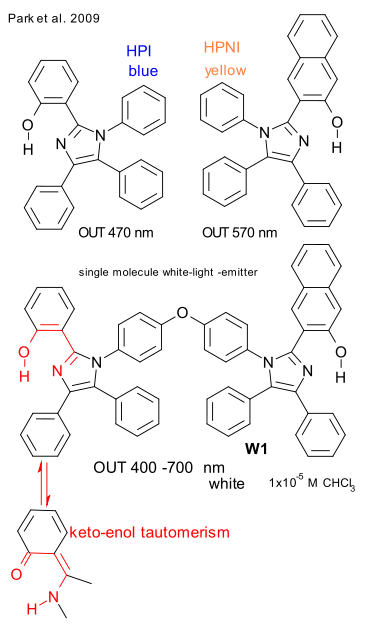 Instead with W1, emissions from both parts of the molecule occur independently and white light results. The full emission wavelength is also dependent on a keto-enol tautomerism process taking place: an enol exited state E* forms from the enol ground-state E which relaxes to a keto excited state K* in a so-called excited-state intramolecular proton transfer (ESIPT). The K* to K jump takes places next with a smaller energy gap (tunable inside visible spectrum) and a K to E conversion then completes the cycle.